This book, Paterno by Joe Posnanski was completed after Joe Paterno’s death. So it brings a completely unique perspective to the life of one of College Football’s greatest coaches. The book is in no way meant to be a defense of JoPa nor does it make any attempt to glorify Coach Paterno. Joe Posnanski merely presents the truth as best he knows it. This alone makes this book unique because in today’s society the truth rarely stands in the way of the media’s story. I’ve read numerous biographies of Joe Paterno, my favorite was No Ordinary Joe by Michael O’Brian & I also thought Pride of the Lions by Frank Fitzpatrick was exceptional especially considering Fitzpatrick’s earlier book about Paterno, A Lion in Winter was calling for Joe to retire. It takes a special guy to admit he was wrong. Perhaps the best view of Joe Paterno comes from the book Playing for Paterno by Charlie and Tony Pittman. Charlie Pittman was Joe’s first superstar & is in the PSU Hall of Fame. Charlie & Tony have a combined record of 44-0 as starters playing for Paterno. I reviewed this book earlier Playing For Paterno. What makes Joe Posnanski’s book different is when it was written. This was after the Sandusky horror. This is after Coach Paterno became Scapegoat Paterno. Posnanski was there during JoPa’s final days. He was there for the firing and the dying. So I recommend this book only if you are interested in the facts of the Paterno story from an impartial observer who deals only in the facts. Joe was the winningest college football coach of all time. Joe had one of the highest graduation rate of any college football coach and always preached and stressed academic excellence. Joe always stood up for his players and never worried about media criticism. He never sat a player because of the media. Joe believed in winning by strong defense, a good kicking game and an offense that didn’t turn the ball over. Joe kept notes on everything. Joe did not like Jerry Sandusky and thought he quit coaching after the 1986 season. He wanted a reason to fire him. Sandusky retired after the 1999 season & worked out his retirement package with AD Tim Curley who granted him access to PSU facilities. Joe was against this because it might be a distraction. 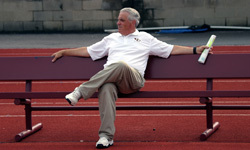 Joe defied the PSU President after the 2004 Season and would not retire. This defiance cost him support in the administration and on the Board of Trustees. This resentment would resurface in 2011. Joe had a great comeback season in 2005 finishing #2 in the nation! PSU was 9-1 in 2011 when Joe was fired. Joe was 84. During the week of Joe’s firing, not one member of the Board of Trustees would return Joe’s call. The media was in a feeding frenzy and blamed Joe, even though no one knew of Sandusky’s secret life. He ran a home for children, he had foster children & the professionals were fooled. After 61 years of service to PSU the Board fired Joe without asking him one question and did it with a phone call. Joe was diagnosed with cancer and died a short time later. These are some facts from the book. Joe Posnanski is a good writer who does an excellent job of presenting an unbiased account of Joe Paterno’s life and of his death. I enjoyed the book so much I also listened to the audio book. There is a lot you can learn from this book. More than how Joe died but how he lived. I strongly recommend this book for anyone interested not in a Saint but in a darn good football coach who tried to do it the right way.